Atalanta might be making waves in Serie A with their attacking play but it is the man they call 'The Wavebreaker' who is making the team tick. Dutch defensive midfielder Marten de Roon returned to the Italian side after his one season with Middlesbrough - the 2016-17 campaign - ended with the Teesside team relegated from the Premier League. However, it has since been a positive experience for the 27-year-old. He helped Atalanta reach the final 32 of the Europa League last season, and this year the Bergamo side sit seventh in Serie A and are currently the league top scorers with 47 goals. On Wednesday they beat holders and Serie A leaders Juventus 3-0 in the Coppa Italia. 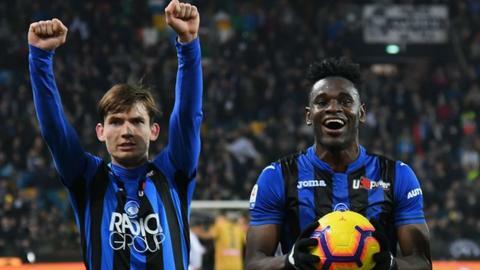 In an interview for the BBC's Euro Leagues podcast, De Roon talks about whether Atalanta could attain a Champions League spot, the effect coach Gian Piero Gasperini has had and his nickname. "It's not a big city, it's got 100,000 civilians. It's a beautiful city - a high city with a big wall, a wonderful view. I'm very proud. For football, it's a very intense city. Of 100,000, there are 90,000 fans of Atalanta - they are close to the team and very motivated to go to the stadium and motivate the team. "So it's a very nice culture where everyone wants the best for Atalanta. It's a city where football lives, where everyone is happy when it goes good and also when it doesn't go how they want, they're always very supportive. It's a nice culture to live in." Are they similar to north-east English club fans? "The support is very passionate in the whole of England. But especially in our [Boro] stadium we didn't have the best results. But even at the end of the season when we went down, people still came - they were positive and said we will bounce back. It's nice to have supporters like that. "Bergamo is a bit similar to how they live football in the north east of England." Could Atalanta reach Champions League? "I'm not agreeing totally with it because we're still a team with six or seven others playing around the same position and points. The squads of Inter, Lazio, Milan are bigger and probably also stronger than our team. But the way we're playing we can make it difficult for everyone. "The coach is a technical genius. We are able to fight and try to go up around those positions. For us, the players, we don't look at the Champions League as it's a little bit far away still." "He deserves it [praise]. It's not because I want to say he's the best in everything. He changed the mindset, the way of playing, the way people looked at the football. "We were a defensive team [during De Roon's previous spell in the 2015-16 season] who wanted to stay in the league. With him the mindset changed to: 'We always have to win, no matter where we play'. You have to work and be prepared for everything you face. Since he's been here Atalanta have been playing for a place in Europe. Before we always played to stay in the league. "The mentality in Italy before was a draw away from home is a good result. He came in and said: 'We are Atalanta and we want to be competitive and have good results and play at a high level. We have to compete with everyone and try to win everywhere'. That's how we go into a game." "In the beginning it was hard for him to understand everything and the way we played. Sometimes he felt not fit enough in the game. But now he feels he can give more than his opponent. "Boom! He is a monster, he is a beast if you see his physicality and his speed. He's in great form. I hope he can continue." "We work hard, especially in training. Everyone works hard during the game. The best thing is we are very comfortable with the ball. "We play with a lot of possession and are very good in front of the opponent's goal. We have a lot of possession in the half of the opponent. If you see us play, you wouldn't say it's a hard-working team, you'd say it's a good footballing team who works very hard. "The strange thing is we went five games without a goal in the beginning of the season when it didn't work. We only picked up six points in our first eight games. Now if we play them again [in the final 19 games of the season] we can take 12 instead of six points from those eight games. We're very happy with how it's going, but we are still believing we can grow. Would you accept a Europa League place now? "Yes of course. Directly. Europe for Atalanta would be something great. If we continue like we ended the first half of the season we have a great chance." "The first year I was here [under another manager], I played as a low [defensive] midfielder with two midfielders in front of me. Now we play a bit differently. We have two midfielders next to each other. I'm not the most offensive player. "We play with high wing-backs who go forward a lot. I stay back for balance. If the opponents get the ball and try to break quickly there's often me back there to break up the play. It can be with a foul or taking the ball or smart positioning. They love it in Italy where you recover balls. Maybe not the most with the ball but they also look a lot without the ball. I played a very good game three-and-a-half years ago in Milan and they gave me the nickname. "I'm proud of the nickname, but it's more important how important for the team. I think I can always help the team with the work you don't see but you will miss if I'm not there."